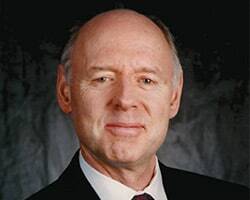 Between degrees from Harvard College and Harvard Business School, Bruce Johnstone served two years in the US Navy as an officer on a destroyer, and joined Fidelity Investments in 1966. From 1972-1990, he managed the Fidelity Equity-Income Fund. During that period, the fund achieved a return of over 1100%, nearly twice that of the S&P 500. This return ranked him as the #1 equity-income fund manager in the nation for the 19-year period. In 1987, Money magazine named Mr. Johnstone America's Best Income Investor. During his tenure on the fund, he oversaw all of Fidelity's Growth and Income funds and chaired Fidelity's Investment Committee. A Chartered Financial Analyst and managing director of Fidelity Investments, Mr. Johnstone is currently serving as senior marketing investment strategist for Fidelity's retail and institutional companies. Eric Kobren, former publisher of Fidelity Insight, one of the leading newsletters researching Fidelity's funds in the US, has said Bruce Johnstone ranks "a close second" to Peter Lynch as Fidelity's best all-time fund manager.